Greater New York Manager Too Hasty with Umpire. 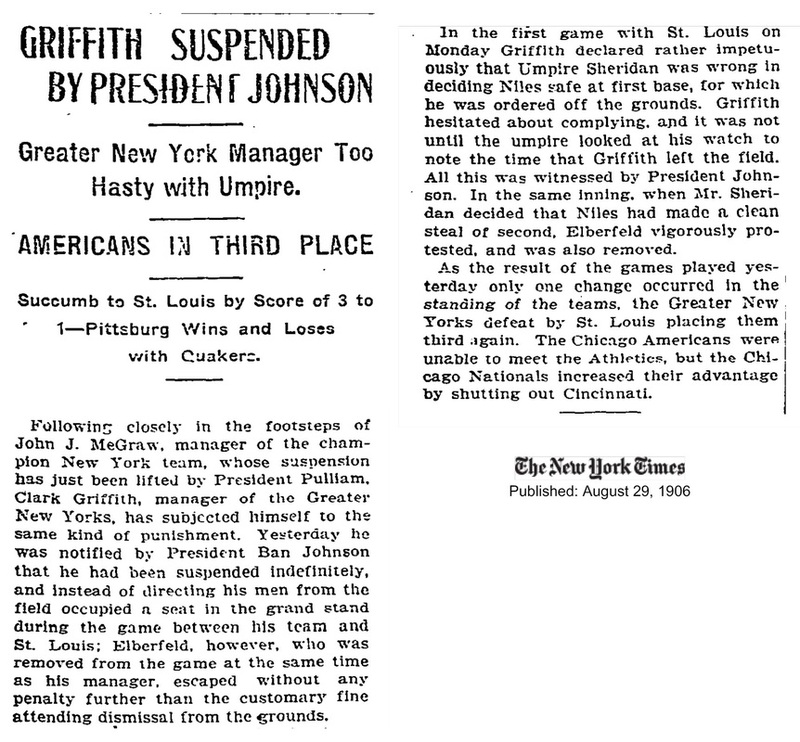 Following closely in the footsteps of John J. McGraw, manager of the champion New York team, whose suspension has just been lifted by President Pulliam, Clark Griffith, manager of the Greater New Yorks, has subjected himself to the same kind of punishment. Yesterday he was notified by President Ban Johnson that he had been suspended indefinitely, and instead of directing his men from the field occupied a seat in the grand stand during the game between his team and St. Louis; Elberfeld. however, who was removed from the game at the same time as his manager, escaped without any penalty further than the customary fine attending dismissal from the grounds. In the fiist game with St. Louis on Monday Griffith declared rather impetuously that Umplre Sheridan was wrong in deciding Niles safe at first base, for which he was ordered off the grounds. Griffith hesitated about complying, and it was not until the umpire looked at his watch to note the time that Griffith left the field. All this was witnessed by President Johnson. In the same inning. when Mr. Sheridan decided that Niles had made a clean steal of second. Elberfeld vigorously protested, and was also removed. As the result of the games played yesterday only one change occurred in the standing of the tams, the Greater New Yorks defeat by St. Louis placing them third again. The Chicago Americans were unable to meet the Athletics, but the Chicago Nationals increased their advantage by shutting out Cincinnati.